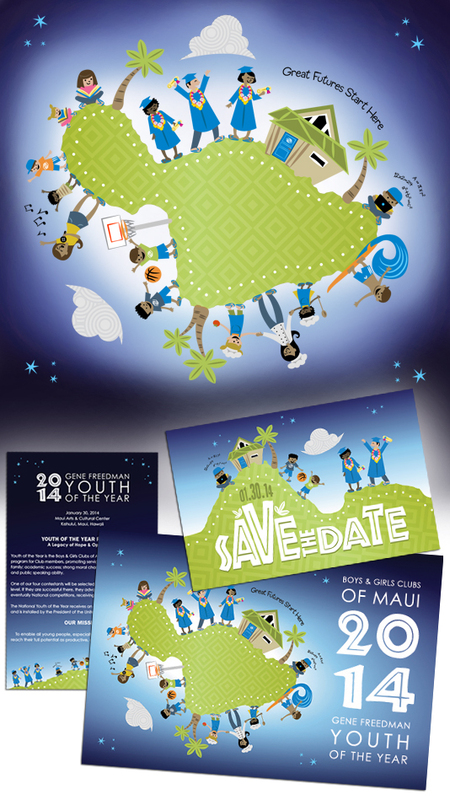 The Boys and Girls Clubs of Maui, Hawaii found us because of the great annual report we did for the Boys and Girls Clubs of Southwest Virginia. They came to us in need of an annual report and print materials for their Youth of the Year event. We designed them more than a few good looking items including tickets, donor forms, stationary, and pictured here a save-the-date postcard, invitation and program. We also donated our time in making a custom illustration of the island of Maui with BGC kids doing all sorts of activities. We used that illustration to tie all of their materials together for a consistent look. What are you doing all the way down here? Hellow Yellow © 2019. All Rights Reserved.